Please drop your loose change/donations in the container to help out Days End in their care of these horses. (see below) If you would like to see more photos and video of these horses – check out the Days End website. Thank you for being a part of supporting our local horse rescue and their outstanding efforts! 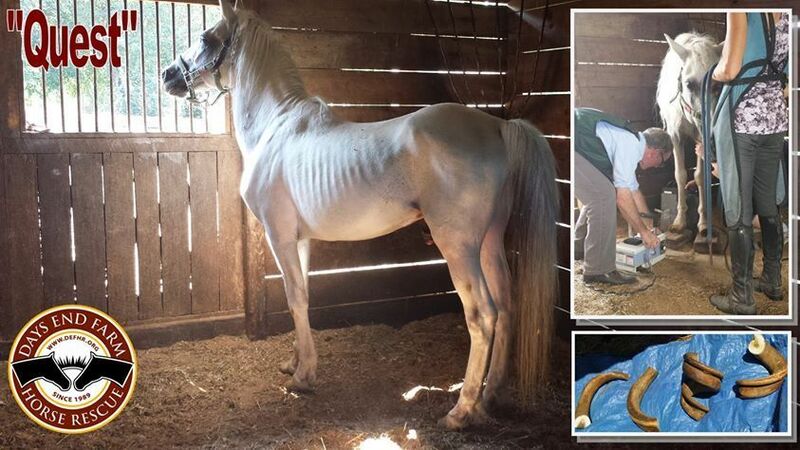 On August 21, 2015, officials of the Humane Society of Washington County, Maryland, called DEFHR to assist with three horses suffering from emaciation and extreme hoof neglect. They had been locked in a stall for at least 15 years. The other two stallions had their excess hooves removed before being safely transported to Days End Farm Horse Rescue. Within a couple days of arrival, the vet took x-rays of “Quest’s” feet to help plan for his rehabilitation. Quest is often heard eagerly calling to future herd mates. “Rio”had his first dental evaluation and trim. Both horses are in critical condition and will require months–if not years–of rehabilitative care. The Humane Society of Washington County officially filed 15 charges of animal cruelty against the owners on August 27th, 2015. The charges for the three severely neglected horses consisted of four misdemeanor charges and one felony count of intentionally causing torture for each of the equines. Probable Cause was found on all charges by the District Court Commissioner, and a Criminal Summons was issued. A court date has been set for October 28. For regular updates on Quest and Rio’s rehab, go to our Facebook page.